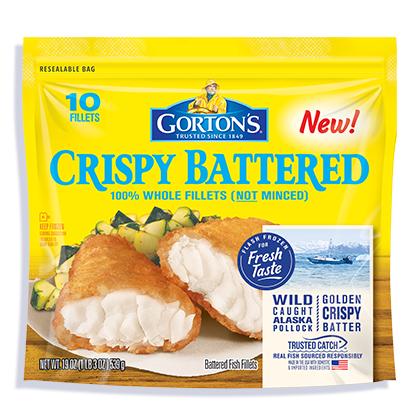 Flaky, wild-caught white fish fillets dipped in a golden, crispy coating. 100% real fish, 1000% delicious. Fresh from the oven in less than 20 minutes, it’s easy to see why these flaky fillets are a classic family favorite. 3. Bake 17-19 minutes total* Flip after 12 minutes. Water, rice flour, wheat flour, tapioca dextrin, modified corn starch, salt, whey, onion powder, baking powder (baking soda, sodium aluminum phosphate, cream of tartar), dextrose, sugar, sunflower lecithin, xanthan gum, yeast, spice, natural flavor.